Hey guys, it's been a while since I've done a Design Notes and I haven't even had a lot of time to read the forums or Twitter. You know that we've had our hands full with the war but there's a lot of other stuff going on behind the scenes which is why I haven't been able to work on the Mid-Week Releases for what seems like forever to me. First off, we have a tutorial in the works. A real one. With very rare exceptions, every game SHOULD have a fun way that gets you into the game while seamlessly teaching you how to play. 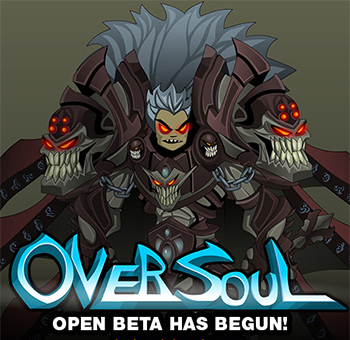 AQW has NEVER had a tutorial before and considering that we get several thousands of brand new players signing up every day, it's something that we have desperately needed for as long as the game has been active. You need a subtle hand when developing a tutorial that gets you into the story and teaches you how to play without making it seem like school work. I've written three different plots for this tutorial and finally got one that I feel will do the trick. I've balanced out the sense of importance with the silly that is AQW's life's blood and I've got a short questline that will teach you everything you need to know to play AQW. This is Serval and you know Twilly. You will meet Serval right after you fall off the mountain at the very start of the game and help this pair fight their way through Sepulchure's undead army (remember? 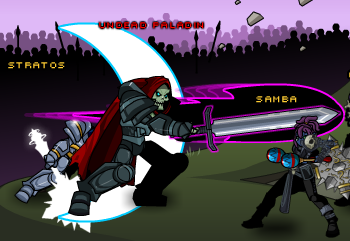 He was invading Swordhaven when the game began) in order to get safely to Battleon where you will gear up before heading off to Swordhaven. 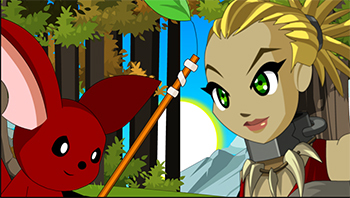 Warlic has already done some brand new music for this area and Samba is currently animating the cutscenes when she finds time between her work on AQW's animation needs and her work on the Legend of Lore monsters. Once that is done Yorumi and I will go through and code all the special one-time functions that you won't need anywhere else in the game. All new characters will play through this and if existing characters would like the Character Page Badge and Book of Lore check-mark, you will be able to play through it too. We have no deadline for when this will release because as much as we need this, it's a secondary project to the more important things going on like the weekly releases and Yorumi's ongoing war on lag. So eventually that snowballed into another project that I've been working on which is the Book of Lore redesign. It's getting a complete overhaul. I went through pages of sketches and hours of tweaking with Artix and Dumoose to find an efficient and user-friendly layout that will guide a new or even an old player thought large portions of the game in a simple graphic fashion. 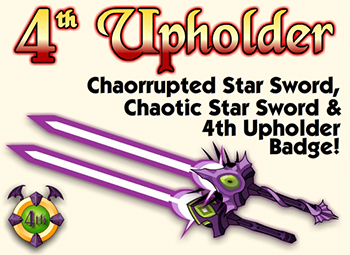 The new Story area will actually feature all 13 Chaos Zones plus the Tutorial and the Swordhaven War. Mouseovers will tell you how close you are to completing the main storyline in each area and even give you a level suggestion for that area (since you can do them in any order you like). As you complete each storyline your silver frame will turn into an ornate gold frame with a big check-mark to let you know that you've completed the main story in that area. Of course each portrait is a button that will take you where you need to go. The new Quests section will feature things like the DoomWood, Etherstorm and Skyguard zones and all the mid-week releases. 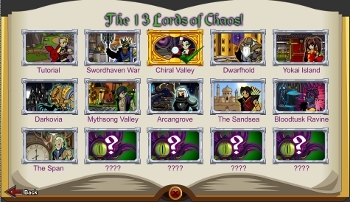 Pretty much everything that ISN'T a Chaos Zone will be in this section and we'll be able to update it dynamically from the database so we can add new stuff without literally re-writing the Book of Lore every time. Once again, each one of the listings will tell you how much of the questline that you've completed, if it is Member Only and serves as a button to take you there either way. The new Badges Area will have a new cleaner layout. 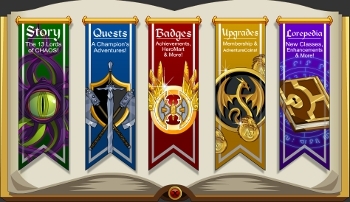 It is broken up into three sections: Achievement Badges for those you earn through gameplay, HeroMart for those you unlock by purchasing AE swag from HeroMart or other stores that carry out stuff and Other Badges for promotional items that you get from AE Upgrade Cards, Crossover achievements for DragonLords, Guardian and Star Captains and other misc. badges. The new Badge Page will pull a lot from HeroSmash's badge layout. 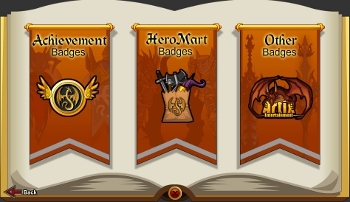 You will be able to scroll through the badges in each section, select one to see a larger version, read the description and either access the shop or find out how to. The other two sections are the Upgrades and Lorepedia sections. The Upgrades will tell you when your membership expires and how many ACs you have currently and (hopefully, when we get this running) you will be able to purchase upgrades and ACs right from your Book of Lore. The Lorepedia section explains a bit about classes and opens Itzachi's shop from anywhere in the game. The Lorepedia Button will link you to the Lorepdeia that Beleen has been fiendishly working on for months. The new and improved Book of Lore is also a secondary project that will be released as soon as we can find time but it requires a lot of coding. Unfortunately Yorumi has been so diligently working on improving the game lag that even guilds have taken a back-seat for now. 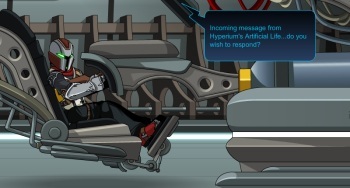 If I could get the clone-o-mat working then we could make copies of Yorumi and Samba and the rest of the team and get everything done all at once. I've been working with the art team and Draven from the web team on projects like the Artix.com redesign and the AQW payment page changes (those buttons don't make or post themselves)and the redesign of AQW's landing page. I've also been working with Mido on fliers, buttons and booth ribbons for DragonCon, and other projects. 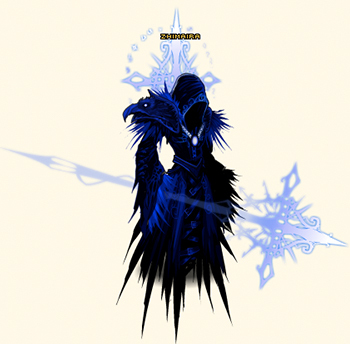 I've been working with Diozz trying to help him with his BILLION projects such as the AQW 2013 Calendar etc. I've been trying to keep up with Faith and her constant stream of HeroMart merch to make sure that all of their in-game items have badges and shops set up correctly and securely in the Book of Lore. 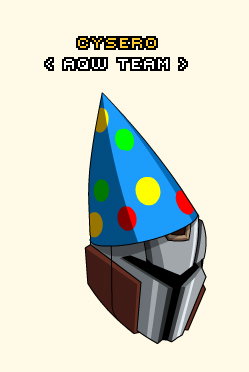 And of course I've been working on AQW. Helping where I can with the new releases, making art, working with Dage on his concept for the Dark Caster class and testing that, animating monsters when Samba is too overloaded to breathe, staying here 12-16 hours beside Alina to help her fix the seemingly endless waterfall of bugs that we've gotten from each war release, doing database entries and trying to help a handful of players with in-game issues when I catch a second to look at Twitter. These are only the projects that I can TELL you about. There are surprises and top secret stuff that I can't even discuss with you. All of this is not counting my out-of-work life AND the fact that I've gone and broken my right elbow a few weeks ago while trying to get a slice of pizza in the middle of the night. As you can see, I'm pretty busy but I feel that I should point out that EVERYONE AT AE is exactly as busy as I am except for Artix who is busier than any three of us. Why not hire more team members? We can't. We're a moderately successful indie game web game company and almost all of the money that we get FROM the game is already going back INTO the game. Why not take on skilled volunteers? Because while most people willing to volunteer are very passionate about helping out they simply don't have the necessary skill level to actually provide any of the help we need. For those who ARE able to help out on a volunteer basis... Aranx, Veneeria, Aegis, Hizu, Mods, AQW Forum Staff, I'm talking to you guys... Thank you. Your skill and work are VERY appreciated. So now you know what I've been working on. In light of all this I HOPE that those of you who are still on summer break go out and HAVE FUN. Enjoy every second of your relative freedom and tell Summer Vacation that I miss her so badly that it hurts. Looks like the war will be ending soon. Friday we've got more Span and Quibble is coming back. 128 days until Just Another Day. Book of Lore says, "WHAAAAAAAAT!?!?!?!?" Why... are you taking me to DoomWood? Down here. It's me. Your book of Lore. You know I can talk, right? Well I can. They say actions speak louder than words, but I can't really move a whole lot on my own, so words are all I've really got. So, about this Doomwood business... are we really going there? ARE YOU CRAZY!? There are giant man eating trees, legions of undead soldiers, necromancers, undead Paladins, and... (did you hear any of the rumors about the Paladin Slayer?) Don't get me wrong. I like traveling with you... but when I write the legends about you, I'd prefer not to be doing it in the belly of some evil tree creature. Books are made from trees you know. And that's just MESSED UP. New Paladin Armor and Weapons! The beginning of a brand new storyline! A dozen Paladin and Necromancer themed armors, weapons, foods and other items! You can travel to LightGuard Keep in DoomWood by using the "DoomWood (NEW!)" 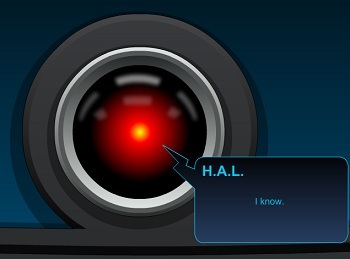 button when you login. Or you can walk there... take the path left out of BattleOn and look for a new road that opened up near Insomniac Beauty. Whew! The AQWorlds Battle Card game has been restocked at Toys-R-Us!